With two distinct mechanisms of action, a new anti-integrin drug may be able to treat multiple targets across a range of conditions. • Integrins are cell surface receptors involved in angiogenesis and inflammation. • Although there are currently no anti-integrin drugs in ophthalmic use, two such agents are in US clinical trials. • ALG-1001 inhibits all three receptors associated with angiogenesis. Researchers have long been interested in the clinical potential of anti-integrin drugs. Integrins are cell receptors that serve as bridges between cells, regulating their interactions with each other and with the extracellular matrix (ECM). They play key roles in biological processes as diverse as angiogenesis, thrombosis, and inflammation, and have therefore been implicated in a wide range of systemic diseases, from cancer to osteoporosis to autoimmune disorders. There are many types of integrin receptors—about 27, each named for its specific alpha-beta combination—and it has been difficult to find agents that effectively inhibit them. Currently, there are no anti-integrin drugs in ophthalmic commercial use; however, that may soon change. Two anti-integrin agents are in US clinical trials for ophthalmic use: lifitegrast (Shire), a compound with the potential to treat ocular surface inflammation that is nearing US Food and Drug Administration (FDA) approval, and ALG-1001 (Luminate, Allegro Ophthalmics), which has retinal indications that are the focus of this article. ALG-1001 is an RGD class oligopeptide that targets four different integrin receptor sites (Table).1-3 It has two distinct mechanisms of action, antiangiogenesis and vitreolysis, making it effective across a number of vitreoretinal conditions, including some for which we have no other treatment. In the scientific literature, three separate integrin receptors (αvβ3, αvβ5, and α5β1) are closely associated with retinal angiogenesis, both the choroidal angiogenesis seen in wet age-related macular degeneration (AMD) and the preretinal angiogenesis associated with diabetic macular edema (DME) and retinal vein occlusion. ALG-1001 binds to and inhibits all three of these receptors (Figure 1). Figure 1. Integrins regulate cell functions and interactions among cells and between cells and the ECM. As they bind or attach to the ECM, integrins activate intracellular signaling pathways and proteolytic changes that promote angiogenesis. ALG-1001 inhibits the connection between the integrins (shown here in purple) and the ECM, preventing downstream angiogenic effects. The anti-VEGF agents that are standard of care for AMD and DME also target angiogenesis but with a different mechanism of action. In a hypoxic environment, VEGF signals the need for additional blood vessels to provide more oxygen. Inhibiting this signal with an anti-VEGF drug, therefore, can stop the development of new blood vessels, which is important. Integrins operate both upstream and downstream of the VEGF pathway. For example, they are involved in the “construction work” of remodeling solid tissue in preparation for the penetration of new blood vessels. They also play critical roles in cell migration, proliferation, and maturation. Although integrin receptors sit on the surface of the cell, communicating outward and regulating adhesion to other cells, they also send instructions to the cell itself. Because ALG-1001 inhibits all three of the receptors associated with angiogenesis, early clinical evidence suggests that it is effective in preventing the formation of new blood vessels as well as shrinking and stopping leakage from existing blood vessels. The drug is currently in phase 2 clinical trials in the United States for treatment of DME; phase 2 studies for wet AMD are planned for later this year. What is clinically most compelling is that ALG-1001 also appears to have a longer duration of effect than current therapies.4 The endpoint in the ongoing trials is efficacy at months 5 and 6, after 3 to 4 months off treatment. There is also a need to learn more about how this drug can be used both alone and in combination with other agents. If earlier results of its potency and duration are confirmed, it is plausible that ALG-1001 could be used for maintenance therapy either in monotherapy or after induction therapy with an anti-VEGF agent. A fourth receptor site inhibited by ALG-1001, α3β1, provides another mechanism of action for a different set of indications. The anti-integrin agent inhibits an integrin-mediated pathway of the vitreoretinal interface, connecting the posterior aspect of the vitreous with the internal limiting membrane of the retina. In blocking this pathway, ALG-1001 helps to achieve vitreous breakdown and separation from the retina. In the phase 1 DME trial, the primary endpoints were improvement in visual acuity and reduction of central macular thickness, but investigators also looked at what happened to the vitreoretinal interface in 11 patients who had no or partial posterior vitreous detachment (PVD) at baseline.4 After 3 months of treatment, six of these patients had developed total PVD (Figure 2). This finding sparked two clinical studies of ALG-1001, for release of vitreomacular traction (VMT) and for induction of PVD in patients with nonproliferative diabetic retinopathy (NPDR). In the recently completed VMT phase 2 study, 65% of eyes treated with the 3.2-mg dose of ALG-1001 achieved release of VMT or vitreomacular adhesion at 3 months, compared with 10% of those in the control group (P = .0129). The NPDR phase 2 study began in April. This is important and novel, as the FDA has not yet approved any drug for the induction of PVD. 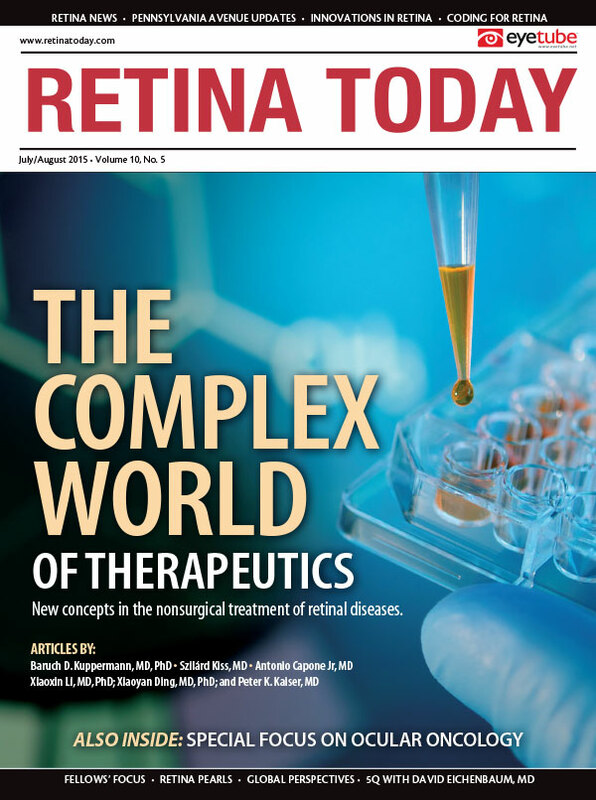 The retina community is divided as to whether inducing PVD can alter the course of diabetic retinopathy (DR). Many retina specialists accept the case reports that demonstrate such a benefit, while others await level 1 evidence from a randomized controlled clinical trial. Such a trial will certainly be warranted in the future, and its outcomes will hopefully help retina specialists understand the role of the vitreous in DR. Many hypotheses exist, and there are likely several events occurring simultaneously. Low-grade traction of the vitreous on the hyaloid membrane may be stimulating inflammation and the release of growth factors that contribute to DR and disease progression. Additionally, overstimulation of VEGF in ischemic conditions may allow elevated VEGF levels to essentially form a depot at the vitreoretinal interface, contributing to disease progression. If adhesion of the vitreous to the retina can be released with a drug such as ALG-1001, it would move the VEGF depot away from the retina, where it can no longer stimulate further damage. Perhaps, by accelerating the liquefaction of the vitreous, a few anti-integrin injections could improve the oxygen exchange in the eye and consequently guard against progression by lowering VEGF levels. This would be particularly useful for the large and growing category of patients with moderately severe NPDR who are at high risk for progression to proliferative DR. If these patients progress, they will end up needing panretinal laser photocoagulation with its associated loss of visual acuity. The possibility of giving such patients a drug such as ALG-1001 to slow or eliminate progression is compelling. Figure 2. As shown in this ultrasound image, the vitreous face is free-floating from periphery to periphery and from the posterior pole to the optic nerve in a patient with DME who was treated with ALG-1001. Baruch D. Kuppermann, MD, PhD, is a professor of ophthalmology and biomedical engineering, chief of the Retina Service, and vice chair of academic affairs at the Gavin Herbert Eye Institute at the University of California, Irvine, School of Medicine. He is a member of the Allegro Ophthalmics Scientific Advisory Board and the Retina Today editorial board. Dr. Kuppermann may be reached at +1-949-824-6256 or bdkupper@uci.edu. 1. Friedlander M, Theesfeld C, Sugita M, et al. Involvement of integrins alpha v beta 3 and alpha v beta 5 in ocular neovascular diseases. Proc Natl Acad Sci U S A. 1996;93(18):9764-9769. 2. Ramakrishnan V, Bhaskar V, Law DA, et al. Preclinical evaluation of an anti-alpha5beta1 integrin antibody as a novel anti-angiogenic agent. J Exp Ther Oncol. 2006;5(4):273-286. 3. Oliveira LB, Meyer CH, Kumar J, et al. RGD peptide-assisted vitrectomy to facilitate induction of a posterior vitreous detachment: a new principle in pharmacological vitreolysis. Curr Eye Res. 2002;25(6):333-340. 4. Allegro Ophthalmics. Data on file.